A potted vegetable garden is perfect if you have little to no space or if you just love gardening in containers. It’s a nice simple and effective way to garden. After all you can grow almost any vegetable in a container or pot. Proper Drainage - The best container for growing a vegetable garden is one that allows drainage of excess water. It’s important to ensure that there are some holes at the bottom of the container for drainage purposes. Light color containers are the best. Why? …because the dark colored containers absorb a lot of heat and too much heat can cause damage to the root structure. 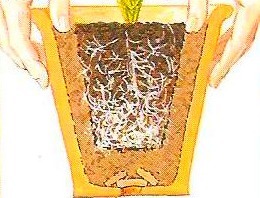 The plant roots can therefore weaken as a result. However, if you only have dark colored pots, you can paint them in a lighter color or just place the containers in a cool, shady spot. When it comes to planting vegetables in containers, size matters. The exact size depends on what type of vegetable you’re growing. For example, vegetables like tomatoes will require a 5 gallon container to accommodate each plant. If however you decide to grow your vegetable plants in smaller containers, keep in mind that you’ll have to constantly tend to them. The best container garden soil to use is one that contains peat and vermiculite. These are considered to be the right mix for container soil. This soil type allows your plants to grow and develop effectively as they will need lots of air exposure and sufficient water supply. To enhance the fertility process, add a combination of compost and soil. When planting your vegetables, use a 100% organic fertilizer to supply them with sufficient amount of food that will last them for the entire development process. When planting vegetables in pots or containers, watering must be done consistently. A potted garden requires more water than vegetable plants that are grown on the ground. As the growing season progresses, the plant root structure will begin to expand. When these plant roots expand, they’ll require even more water. So, when it comes to watering your plants, you’ve got to be 100% dedicated. You can monitor your pots or containers every day to determine if there’s enough water. 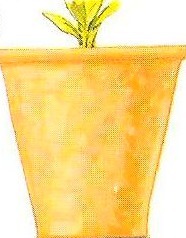 Vegetable plants can either be potted or planted. Planting is the process of setting the root ball in a hole that was scoped out of the compost. Potting on the other hand, is where the root ball is place onto a layer of compost and then some compost is added around it. …When the plant roots have filled up the pot. Other signs include the plant roots growing through the drainage hole, compost that dries very quickly and slow down of the growing process. 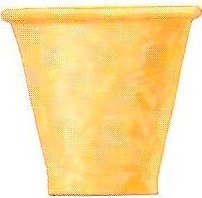 Step 1- Pot sizes can be about 2-3 inches (5-7.5 cm) in diameter. This is appropriate for each potting stage. When the plant has grown to the desired size you can stop. Clean out the old pots by scrubbing them thoroughly. The clay type pots can be soaked overnight. Step 2- Supply some water to your plant. Remove the plant from the pot at about an hour later. 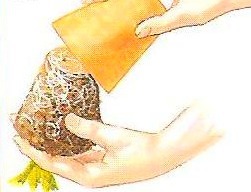 To remove the plant easily, you can knock the pot on the edge of a hard surface and then use a knife to run around the root ball. You can also remove the old crocks. Step 3- Use some crocks to cover the drainage hole in the clay pot. Add a layer of some potting compost and then place the plant on top of the layer. Cover up the surrounding space with some moist potting compost and then press it down firmly using your thumbs. Step 4- Tap the pot a couple of times on a hard surface and leave 1 inch space for watering. Ensure that you always water your plant thoroughly. Keep the pot in a shady spot when the weather is hot and dry for about 7 days. When the container is too small to hold the plant, it’s best to transfer it to a bigger one to accommodate the size. As soon as there’s a change in the weather, you can remove the plant just like in the steps above. Use a small hand fork to play with some of the old compost away from the root ball. You can trim off some of the root tips but not to reduce the size of the root ball to more than 25%. You can pot up like in the steps above using the same size pot. Growing a potted vegetable garden is easy, fun and rewarding once you provide special care. A potted vegetable garden is excellent for those who are now entering into vegetable gardening as it doesn’t require much effort. It also allows you to implement some cool gardening ideas and techniques.